Rescuers answered hundreds of desperate calls for help Sunday in areas of Texas as floodwaters from the remnants of Hurricane Harvey climbed high enough to begin filling second-storey homes, and authorities urged stranded families to seek refuge on their rooftops. Rising floodwaters in Texas from the remnants of Hurricane Harvey chased thousands of people to rooftops or higher ground Sunday in Houston, overwhelming rescuers who fielded countless desperate calls for help. The murky water rose high enough to begin filling second floors. Authorities urged people to get on top of their homes to avoid becoming trapped in attics and to wave sheets or towels to draw attention. Areas south of Houston appeared to be at greatest risk. Some flooding was reported in downtown Houston and in the Texas Medical Center. 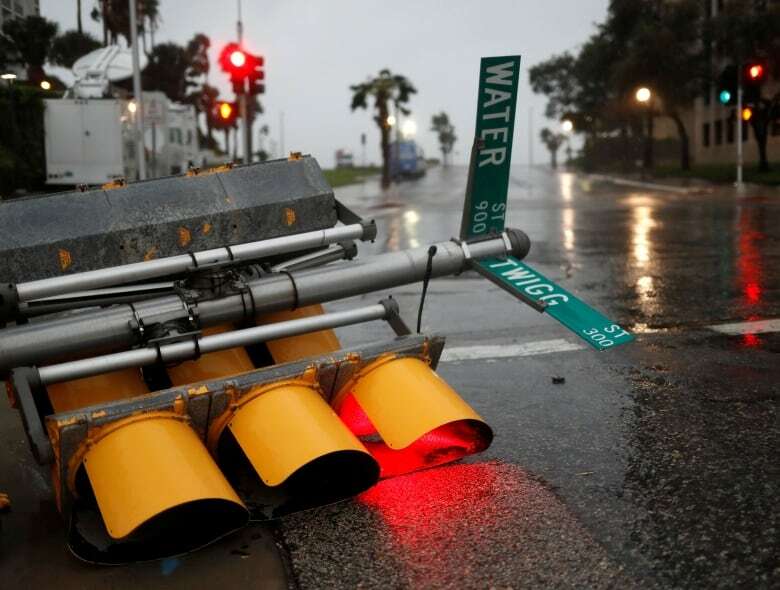 Harvey spun deeper into Texas and unloaded extraordinary amounts of rain Saturday after it crashed into vulnerable homes and businesses along the coastline in a blow that killed at least two people and injured up to 14. Reports say at least five people have died, but only two deaths have been confirmed. Throughout the region between Corpus Christi and Houston, many people feared that toll was only the beginning. Harris County Sheriff Ed Gonzalez used Twitter to field calls for assistance for people trapped inside homes, attics and vehicles. Among those seeking help was a woman who posted: "I have 2 children with me and the water is swallowing us up." Officials urged people not to crawl into attics but to get on top of them. Police evacuated two apartment complexes overnight in the Greenspoint neighbourhood, rescuing more than 50 children from rising water. At a news conference Sunday, Houston Fire Chief Samuel Pena said authorities have made more than 250 vehicle rescues in the storm. "Stay off the roadways when we get heavy downpours. It's difficult to see. It's difficult to manoeuvre. Those low spots will disable your car and then you are a sitting duck," said Pena. Pena said officials have responded to 2,500 calls and have 1,000 waiting. Officials urged people to stay at home, taking to rooftops if water rises dangerously, rather than trying to relocate on foot or in a vehicle. 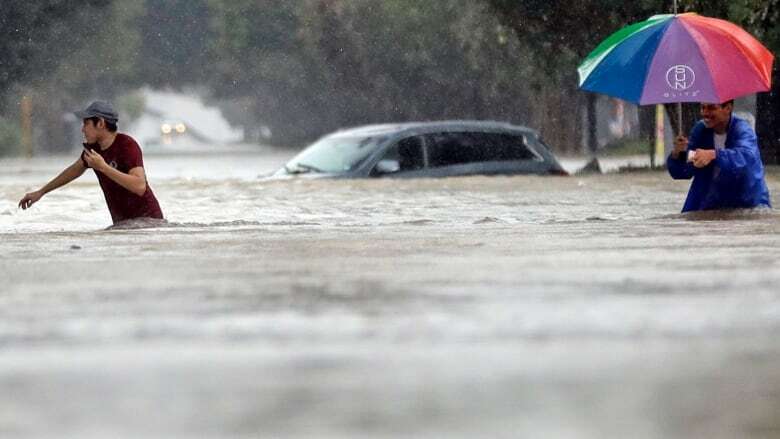 During the news conference, Houston Mayor Sylvester Turner defended his decision not to ask residents to evacuate before the heavy rain swamped roads and neighbourhoods across the nation's fourth-largest city. Turner said there was no way to pinpoint which neighbourhoods would be worst hit. He said every neighbourhood has received at least some flooding. He said, "If you think the situation right now is bad and you give an order to evacuate, you are creating a nightmare." "You can't put 2.3 million people on the road." Houston officials have used dump trucks, city buses and boats to move residents to higher ground. The city is opening additional shelters in libraries and community centres, for those forced out of their homes. Houston's William P. Hobby Airport shut down its airfield early on Sunday due to standing water on the runway, cancelling all flights. The arrivals section of the airport was also closed as waters rose. In Friendswood near Houston, authorities asked people with flat-bottomed airboats or fuel for them to help rescue people from flooded homes, KPRC-TV in Houston reported Sunday. 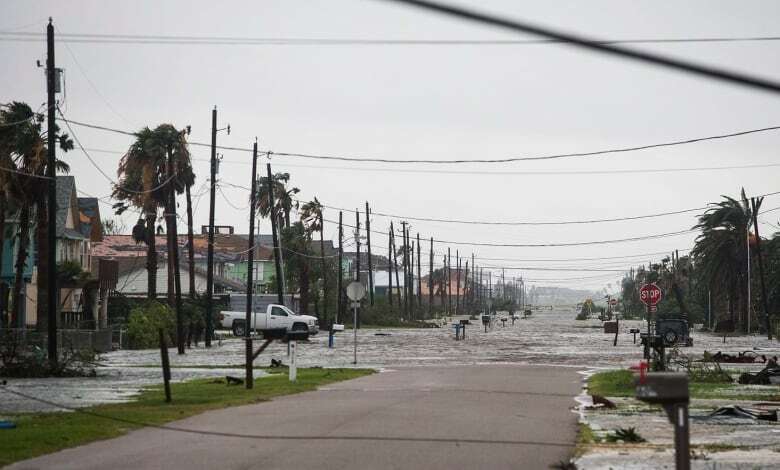 Anxiety ran high throughout the region between Corpus Christi and Houston because some of the areas with the greatest hurricane damage were inaccessible to rescuers. And the forecast for days of steady rain threatened to inundate the region's flat landscape with as much as 100 centimetres. Officials in Victoria, Texas, said Sunday on Facebook that the city of 85,000 has no water service and limited power. They said Harvey had a "devastating" impact on the city, a part of Victoria County that was under mandatory evacuation, and that it could be weeks before all electric service is restored. They also warned those who decide to return to bring enough food and water to last several days. 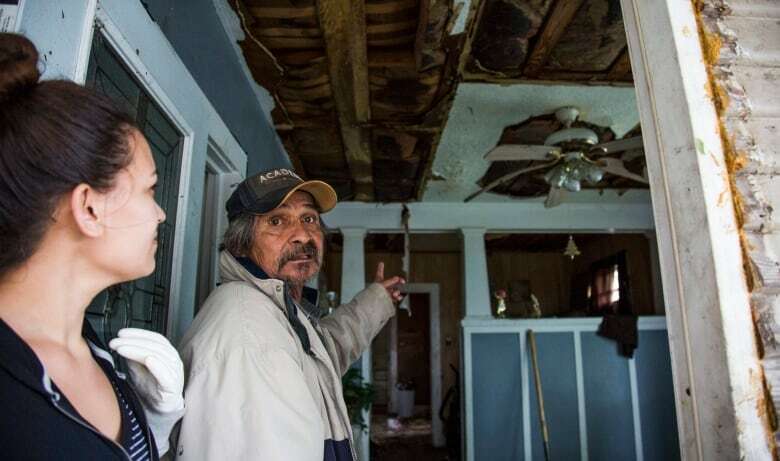 One person was killed in Aransas County in a fire at home during the storm, County Judge C.H. "Burt" Mills Jr. said. A second person died in flooding in Harris County, where Houston is located. Gary Norman, a spokesman for the Houston emergency operations centre, said late Saturday the person was a woman who appeared to have gotten out of her vehicle in high water, though authorities had not confirmed a cause of death. She was found by neighbors about 25 metres from her vehicle, and Norman said she was pronounced dead at the scene by a doctor who was in the area. 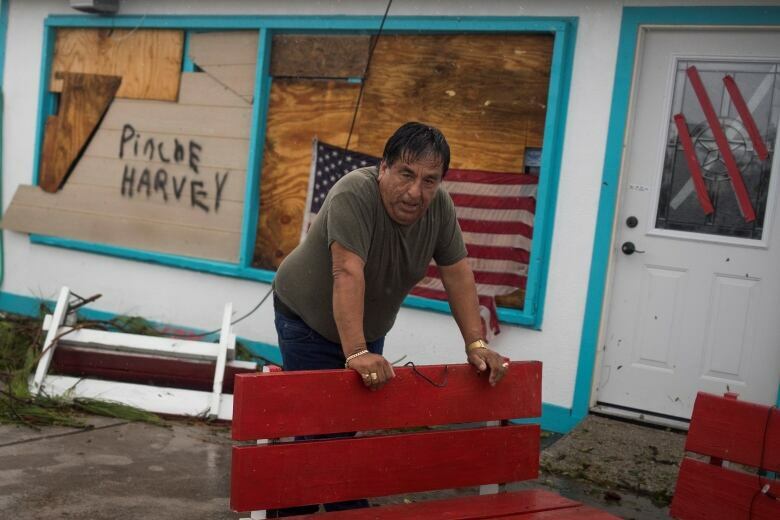 The fiercest hurricane to hit the U.S. in more than a decade came ashore late Friday about 48 kilometres northeast of Corpus Christi as a mammoth Category 4 storm with 209 km/h winds. By 4 a.m. Sunday, the National Hurricane Centre said Harvey continued to cause "catastrophic flooding in southeastern Texas." Harvey's maximum sustained winds were about 72 kilometres per hour, but the storm was practically stationary as it dumped torrential rain over an area that included Houston. 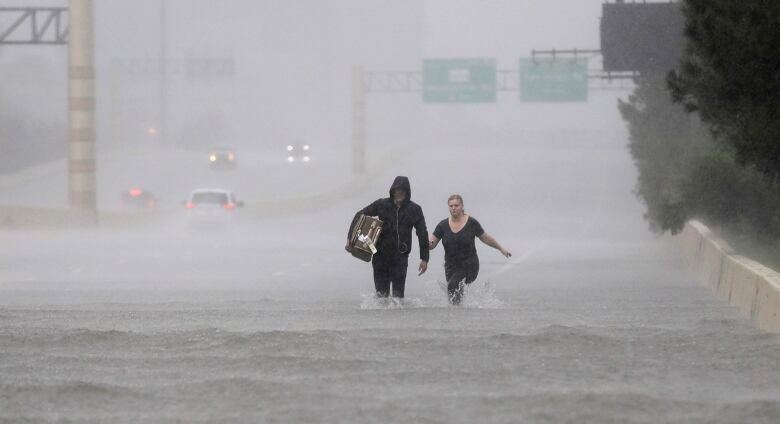 ​In Corpus Christi, the major city closest to the storm's centre, wind whipped palm trees and stinging sheets of horizontal rain slapped against hotels and office buildings along the seawall as the storm made landfall.